The beast: Atari ST 1040 with an external hard drive. 1Mo RAM / 20Mo to store in the hard drive. DAW: Notator. + a tiny midi sound bank that should be somewhere in my garage... I forgot the name. Is that a roach in there You don't have to answer that . Glad you gave up the fags and were able to upgrade your studio with the money you saved. I thought you might have been at this game for a while Phil. Yes I'm part of the dinosaur's club now I'm affraid But I'm still a young dinosaur ! Hi Phil! I just sold my Atari 1040 last fall. I won a 520 st in a songwriting contest in 1987..1st prize actually! Then I bought Dr T's sequencing KCS..ended up working for them for a couple years in Boston. I still have some of the software. Upgraded to a newer Atari in 1992. I synced it with a Fostex 8 track. Then I upgraded to a Roland VS1680 and used the Atari with it. Is that a Boss Dr Drums I see? Nice to see another Atari user! 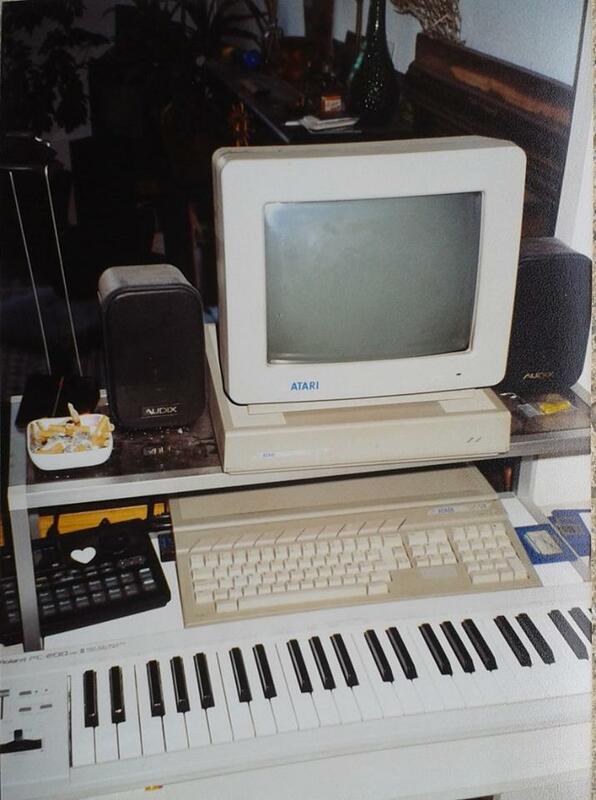 I can't figure out how to insert a picture..I tried showing that setup a while back..
'97....ahhhh..had an Amiga running Music X and sync'd to a blackface Adat by striping one track with timecode with a Phillip Rees TS1 ... Sound sources were a Yamaha SY35 & TG300, Casio CZ1000, Roland MC303 plus some outboard all patched in to an Allen and Heath 8buss mixer. Wow ! That was all good stuff back then guys ! PS: Linda, for pictures. You need to upaload your picture on a host (website), copy the link to the picture here, between the bbcode "Img" (among the blue buttons on the top when you post something).